When you inhale, air flows into the lungs via passages called the bronchi. Bronchitis is the swelling of the lining of these passages. This swelling leads to chest discomfort, difficulty breathing, and coughing. The following symptoms are all characteristic of bronchitis: low grade fever; shortness of breath, especially during light activity; fatigue; wheezing; and a cough that produces clear or yellow mucous. Many respiratory illnesses have similar symptoms and can be difficult to distinguish. To differentiate between bronchitis and other respiratory conditions, a doctor may use x-rays, cultures of the mucous produced during coughing, or a pulmonary function test, where the patient blows into a device that measures the amount of air flowing through the lungs. These tests are used to distinguish between bronchitis and bacterial infections such as pneumonia and whooping cough. There are two types of bronchitis: acute and chronic. Acute bronchitis often develops following a cold, flu, or other respiratory illness. 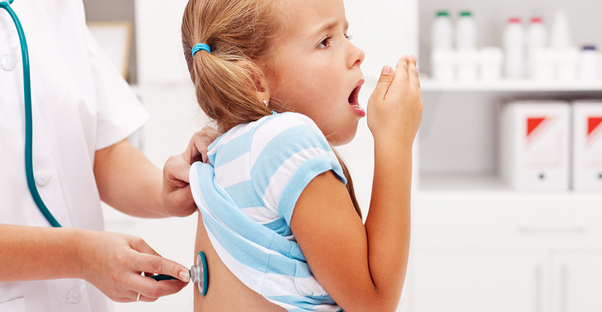 Because children are exposed to the cold and flu viruses at school, they are also susceptible to acute bronchitis. Acute bronchitis is common in children, and typically only lasts a few days, although a dry cough may persist for several weeks. Chronic bronchitis is an ongoing irritation of the lungs and is characterized by a mucous producing cough that lasts for a minimum of three months. While chronic bronchitis can occur due to cold and flu viruses, it is most often caused by exposure to second-hand smoke. According to the Centers for Disease Control, 60% of children between the ages of 3 and 11, or approximately 22 million children, are exposed to second hand smoke. There are over 250 toxic chemicals in second hand smoke, and because their lungs are still developing, children's lungs are especially vulnerable to inflammation due to these toxins. This chronic inflammation of the bronchial lining makes children more susceptible to other respiratory diseases, such as bacterial pneumonia. Asthma is similar to bronchitis because it also is characterized by an inflammation or narrowing of the airways. The difference is that asthma involves a tightening of the muscles around the airways, while bronchitis is an inflammation of the lining of those airways. If a child already has asthma, bronchitis can worsen asthma symptoms, or lead to an increased number of asthma attacks. When both bronchitis and asthma are present, their symptoms are amplified, and a condition called bronchial asthma is present. Like other respiratory conditions, bronchitis can be quite serious, especially in children or pregnant women. Similar to other infectious diseases, bronchitis can sometimes be prevented by frequent hand washing, getting enough rest and eating right. Avoiding exposure to second-hand smoke is one way to protect your child from developing chronic bronchitis. If you believe your child has bronchitis, seek medical attention. A physician can rule out other illnesses and prescribe the best course of treatment to help your child recover quickly.